Today is my last day with HSBC. As expected from someone who has always had separation anxiety issues, I spent last night dreading my last few hours with this company. You see, I'm never good with goodbyes; I cry a lot, then I laugh, then cry even more, and then laugh at how ridiculous I must look. Now I must have cried BUCKETS today but I didn't even care. I made sure to make my teammates and other special people I've come to know here sign my planner and they left really sweet messages. Oh, I also got hugged lots of times today! Hugs that are warm, comforting, reassuring, and encouraging at the same time. I love those kinds of hugs. What they say is true: the customer service/ call center industry really does promote camaraderie, and in the span of time I've been with the company, that is probably the one thing I will remember the most. More than anything else, I feel so blessed that I was able to forge friendships as strong as what I have with them: the kind of friendship that I know won't change even with the change of location, career, or circumstance ♥ As my former teammate Jotag said, this is not goodbye. I just have to rest my headset and log off. This being the last day I can completely use our office facilities, I decided to wait for my friend Michelle until the end of her shift which is 10PM. It is only 7PM now but I've made plans to have dinner with my friends from other departments so it won't really be too long a wait. And so, this is the last post I will be writing using the computers at our diner, and this is the last time I'll buy food from our concessionaire. I will definitely miss all of these, but surely there are lots of things I can - and should - look forward to. I will be back on the 20th though. The party for employees who've been with HSBC for five years that was supposed to be held last Thursday was cancelled because of the floods, and the Best Place to Work team said they will arrange for me to be able to enter the premises just so I can attend. Awesome. Oh yeah, another thing I will miss is the way HSBC throws parties. Aww. Come Monday I will be working in a completely new environment. I don't think I've ever discussed here what my new job will be, have I? I will be working as a Social Media Marketer for ARC PR and Outsmark. In a nutshell, I will deal with market research, blogs, and social networking sites: things I love tinkering with even when I'm spending my rest days at home. I will be earning less than what I currently earn here but that's okay. I just feel that I am meant to do this, so this is me heeding what the Universe is telling me. I am anxious, I am excited, and to be honest I am also a little lot scared. But if I will look at myself the same way my friends here look at me, then I think I will be fine. They have such faith in me and in what I can do that it's hard not to believe it too. I can't wait! Original photo from the lifestyle session I did with Tracey last year, edited with Picute app. I want to have that kind of attitude no matter what so I want to put it here as a reminder. Hoo boy. Continue crossing your fingers for me, will you? improve, or shape ourselves into what we desire. at the very least, in the right direction. 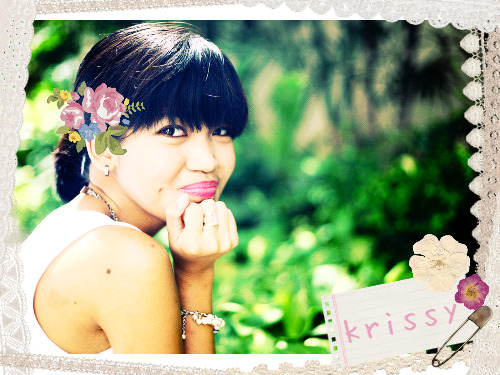 hey krissy! i am happy for your success through life and learning :) i know how it feels to finally feel like you belong somewhere in a work environment :) congrats my dear. i wish you all the best. :) you look very happy and in fact hopeful in that picture which belongs in a magazine! I'm excited for you, Krissy!!! ♥ You're sooo cute lalo na sa pagpapa-sign ng planner. Sarap basahin all those pagkatapos, and read them again after a couple of years... :') Congratulations din sa new work mo. All the best for you! Do blog about how your first day at your new job will go. :) Lesser man ang pay, but the thought of doing something you love will be fuel enough to keep you going. The monetary compensation is only secondary. Excited na ako for you! God bless on your new job. We have the same separation anxiety. Goodbyes are but temporary as long as you keep in touch. And hey, work won't feel a lot like work since you'll be doing what you love come Monday! Cheers! I am so excited for you and this new adventure you're embarking on, and I think it's amazing that it's something you really enjoy doing! Hope you'll still get special invites to HSBC parties, though ;) Have a great weekend! But hey I'm happy for you na dun ka pupunta sa mas gusto mong work!! Even if it means that you'll be earning less, I think proof yun na you're brave enough to really go after your heart's desire. :) I wish you luck!!! PR company ka na, does that mean para ka na sila Jenny Yrasuegi? If so, I'll be waiting for your first email! Hahaha!! Miss you!!! Thanks Edaj! Or Jade? :D Cheers!